The Dallas Stars obviously saw something in defenceman Dawson Barteaux that they liked. 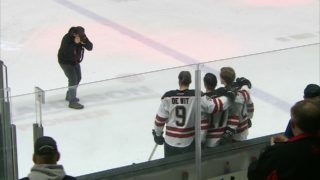 Unfortunately the same couldn’t be said for Barteaux’s Red Deer Rebels teammates Kristian Reichel, Chris Douglas, Jacob Herauf and even Brandon Hagel. While Barteaux was selected by the Stars in the sixth round of the NHL entry draft Saturday in Dallas. Reichel, Douglas and Herauf were passed over despite being ranked by Central Scouting for the annual event. Hagel, meanwhile, was available in the draft for a second time after being selected by Buffalo in the sixth round two years ago but never signed by the Sabres. Barteaux clearly impressed the Stars with his skating ability and offensive upside to the extent that they took him with the 168th overall pick of the draft. The Foxwarren, Man., product, 18, enjoyed a lucrative 2017-18 Western Hockey League campaign — particularly the second half — scoring three goals and collecting 32 points in 64 regular season games and contributing three assists in five playoff contests. “I was happy for Barts. 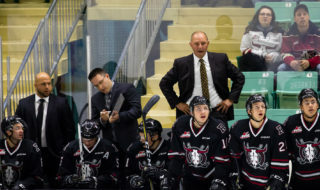 I thought it was great,” Rebels GM/head coach Brent Sutter said of Barteaux’s entry draft selection. “He started coming on the second half of last season, he showed more confidence in the skill part of his game. Although Reichel turned 20 earlier this month, it was still somewhat surprising that he was snubbed in the draft considering he was Central Scouting’s 53rd ranked North American skater for the draft and was projected as a fourth or fifth round pick. 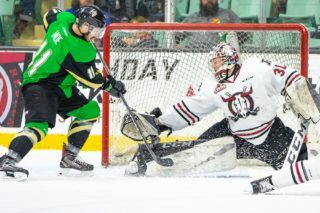 In addition, he sniped 34 goals during the regular season and was arguably the Rebels’ best player in the post season, scoring three goals and adding two assists in the club’s five-game, opening-round loss to Lethbridge. “Yes, I was actually (surprised),” said Sutter. “I was getting calls from NHL teams during the day and was told by some teams that they were going to pick him in the next round, but it kept going on and no one was taking him. Reichel could still land a free agent contract with an NHL club, but nothing has surfaced so far. The same situation exists with Hagel, who will celebrate his 20th birthday in late August and is a candidate to get a free agent deal. Sutter, though, wasn’t taken aback with Hagel’s exclusion from the draft. “To be honest, I don’t know how many 19-year-olds were even taken this year,” said the Rebels boss. 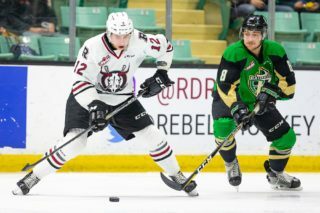 There’s a strong likelihood that the Morinville native will be back with the Rebels as an overage forward. His presence would be welcomed coming off a season in which he flourished down the stretch and finished with 65 points (23g,32a) in 61 games, including five goals in the playoffs. As for Douglas and Herauf, they were essentially long shots entering the draft after being ranked 168th and188th on Central Scouting’s list of North American skaters. Sutter said that both players can use the draft snub as motivation, plus . . .
“It’s a good thing for them to understand and realize that to be drafted into the National Hockey League you’ve got to have a good season. You can’t have an inconsistent year,” he stated. ° Rebels defenceman Alex Alexeyev was the final pick of Friday’s opening round, selected 31st overall by Washington, and was thrilled when he was contacted by Capitals superstar Alex Ovechkin. Despite missing chunks of each of his first two seasons with the Rebels due to injury and the sudden passing of his mother in January, the Russian rearguard was projected as a late first round or early second round pick in the entry draft. Alexeyev didn’t arrive in Dallas until Thursday night and was unsure if he’d be able to even attend the draft. ° Red Deer will pick 17th in the Canadian Hockey League import draft on Thursday. 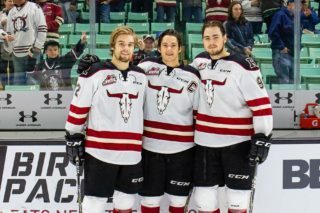 With Alexeyev expected to return to the Rebels for a third season, Sutter will make just one selection in the two-round draft. One interesting note for this year: After a four-year ban on selecting import goaltenders, they are now once again eligible to be drafted.